Film scoring. MIDI orchestration mockups. Musical instrument tracking, engineering and production. Video editing mainly for YouTube channel. Web development. Part time Macintosh IT consultant. What hardware is included in your Apple setup? Mac Pro (2009) with updated 5,1 firmware. The Nehalem 2 x 2,26GHz CPUs have been swapped for dual hex core Westmere X5690s for a total of 12-cores running at 3,46GHz. Other specs include 64GBs of OWC RAM. An OWC 480GB Accelsior PCIe SSD card . A Sonnet Tempo Tempo SSD Pro Plus 6Gb/s eSATA / SATA PCIe with dual 2.5” SSDs. A Sonnet Allegro Pro USB 3.0 PCIe card. (3) internal OWC Mercury Extreme SATA SSDs, a 3TB Toshiba HDD Time Machine Drive and a BlueRay optical drive. This MacPro is my Vienna Ensemble Pro 5 slave MacPro. All SSDs hold orchestral samples. No other third party apps are installed. One OWC eSATA dual HDD enclosure with two 3TB HDDs for Carbon Copy Cloner backups. Mac Pro 3,1 (2008) 2 x 3GHz Xeon 8-core. 32GBs RAM. Samsung 840EVO 500GB boot SSD. (2) Samsung 250GB 830 SSDs in RAID 0 for orchestral audio samples (installed in lower optical bay). (2) Samsung 250GB 840 SSDs in RAID 0 for orchestral samples. A 3TB Toshiba HHD for the Time Machine drive. An OWC eSATA card. One OWC eSATA dual HDD enclosure with two 3TB HDDs for Carbon Copy Cloner backups. Digital Performer, Sibelius, FCPX and Photoshop are the main apps, but this MacPro also acts as my internet computer, and is also the host for the Vienna Ensemble slave MacPro. (Note, there is a third MacPro that you can just barely see in the photo that I just bought and plan on integrating into my Mac Pro farm, but it’s not listed here). iPad Mini with Retina display with 128 storage. Lightning to USB adapter for MIDI keyboard. iPhone 6 Plus for capturing video and photography for video editing on the FCPX MacPro. Apple TV 2 using AirPlay for demoing finished film scores to my home theatre. The rest of my studio is non-Apple pro audio gear. Why did you choose this particular Mac setup? It all started with my obsession with all things Mac and my music degree. I chose the high-core count Xeon MacPros because my main three apps (Digital Performer 9, Vienna Ensemble Pro 5 and Kontakt 5), take full advantage of multiprocessing and with the demands placed on computers in MIDI orchestration film scoring rigs, every CPU core and thread count is needed, as is a very high memory requirement (48GBs to 64GBs per machine is usually my desired minimum and that need is ever increasing). For OS X, my favorite app is Digital Performer. Couldn’t live without Terminal and Activity Monitor. But I also very much need Vienna Ensemble Pro, MIR, Kontakt, DSP-Quatro, iZotope RX Advanced, Sibelius, Screenflow, FCPX, Motion and an obscene amount of virtual instruments, sample libraries and plugins. For iOS, my favorite app is GuitarToolKit due to its flawless design, but also use many apps in my daily workflow including AmpKit, DP Control, V-Control, Garageband, Alchemy, iProphet, iRealPro, ProCam 2 and XL, Pages, Numbers, Evernote, Fing, and Youtube Studio. Do you have any Apple tips or productivity tricks you want to share with OSXDaily readers? All Mac users should spend some time getting familiar with and utilizing Gestures, multiple desktop spaces, memorizing keystrokes, and Terminal and Activity Monitor (keep Terminal and Activity Monitor open at all times in a separate desktop space then use control-right arrow key or left arrow key, or use a quick swipe gesture on the Magic Track Pad or Magic Mouse to easily view that desktop). iMac, MacPro and Mac Mini users should own a Magic Trackpad and if it doesn’t bother their workflow a Magic Mouse for the gesture capabilities alone (watch out for latency with the Magic Mouse under heavy OS X loads). For users who have extremely large files, or a bunch of files that come close to filling up RAM (this happens to me with my orchestral template despite having 64GBs of RAM), don’t hesitate to use the Terminal command “sudo purge”, to clear out memory cache and to keep the OS from moving compressed data to the disk. Although OS X does a fine job of managing memory on it’s own, users who push above 80% of physical memory constantly with just one or two apps should get in the habit of managing memory themselves. Also, memorize the Terminal commands that are applicable to your workflow. If a user combines the power of the Terminal, the efficiency of using Gestures, keystrokes and Desktop Spaces, and keeps an eye on memory via the Activity Monitor their workflow would increase exponentially! I also use an Apple TV to enhance my workflow and improve the overall Apple eco-system. And last but not least, check OS X Daily for great Terminal Tips and other workflow advice! Send us your Mac setups! Go here to get started, all you need to do is answer a few questions about hardware and how you use it, and send it in with several high quality pictures. If you’re not ready to share your own setup yet, enjoy browsing through previous featured workstations instead. This is a really great setup, thanks for sharing Steve. 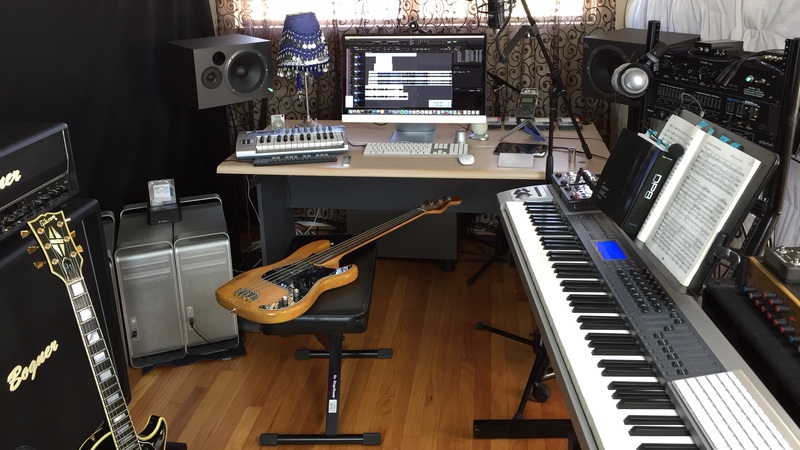 I have a question because I am totally newbie so excuse me if this is rather simple… but how do you interface guitars, bass, and keyboards with the Mac? Do you have a MIDI to USB interface that you connect them all to? If anyone has an idea how to import a guitar to play into something like GarageBand or Logic, and also how to connect an older MIDI keyboard to a Mac, I would love to be able to do that, but no idea how! Thanks in advance! Davis – All of my MIDI keyboards have USB/MIDI type B outputs (USB can carry MIDI), so I just plug my keyboards directly into my Macs with a USB type B to type A cable. Some MIDI keyboards need more power than others so you might consider a powered USB hub for all of you MIDI devices. If you have a keyboard with the traditional 5 pin MIDI port, then you will need a MIDI interface. I have a MOTU MIDI interface handy for my old synths, and many companies make these. I also use a MOTU audio interface. If you look at the photo at the top of this article, directly above the music stand in the rack is my MOTU 896HD interface. That interface has eight XLR and 1/4″ inputs and outputs that I use to connect microphones, guitars, basses, keyboards and anything else I need for recording into my DAW. Again, many companies make these. Check your local music store or look at a popular website like Sweetwater or Musician’s Friend (there are many sites like these), and look for audio interfaces. Most interfaces connect to your Mac via USB, Firewire or Thunderbolt. Some have inputs that match the impedance of a guitar’s output. MOTU makes a device called the ZBox that matches impedance if your interface does not. A direct box can also do the same thing. Nice reply, I was wondering the same thing. Cheers. You need an audio interface David. For instance I use an M-Audio Fast Track Pro with just two dual purpose inputs. iE they take either standard instrument jacks or mic canon style. M-box is another popular option and there are others and they don’t cost a huge amount certainly under $200. I have that same HP monitor connected to my Mac mini. What monitor is that exactly? Cameron – It’s an HP Pavilion 27xi. It’s a great monitor! I bought it during a Black Friday sale last year directly from HP for $225. I was surprised when they told me that for around $300 total I could have bought two of them. I really should have done it. I plan on buying another one this year if I’m lucky and HP has that same sale. The monitor is very clear, crisp and bright. I’ve had no issues with it. It’s a great deal if you can’t afford an Apple monitor. As you can see it just about looks like an iMac. Really nice work station, musicians dream!! Why do you use Digital Performer over other DAW’s like Logic, Pro Tools or Ableton? Hi Jessie – Good question. Digital Performer is very good for composing to film/video. It’s syncing capabilities are second to none. It also works extremely well with Vienna Ensemble Pro (which hosts most of my samples on my slave MacPros). DP is always in multi-timbrel mode (it’s MIDI tracks are separate from it’s VI tracks which I really like). My orchestral templates can get up to 300+ MIDI tracks. DP is very good at this kind of workflow. But I can also work in large audio track templates and DP feels equally at home. It adapts to each environment well. When I first started out I tried DP, Cubase and Logic. For my tastes Digital Performer felt the most powerful and the most logical. I do use Pro Tools to exchange files. I sometimes mix in PT. An engineer I work with mixes in Pro Tools. But for MIDI orchestration most composers I know use either Digital Performer, Cubase or Logic. I would hardly call that “pro”. Setup is in front of a window, and the reflective surfaces around the setup would create a horribly inaccurate acoustic environment. There is absolutely no acoustic treatment visible and areas clearly need treatment for accurate monitoring. The headphones hanging in front of the right monitor, that’s not going to help. The (audio) monitors are far too low they should be centered at ear height not aimed at the listeners chest. it’s a nice basic audio setup, but definitely a long, long way from professional. Grumpy this morning? The guy is a professional musician, that makes it a pro setup. Get over it, not everything is going to look like your dream. Guess what, I’m a developer and all my desk is is a simple MacBook Pro, that’s it. yohoo – You’re not seeing the complete picture. Let me clear up any misconceptions. I have a movable baffle that covers the window when I need to track or mix. The room is in the shape of a trapezoid. The side walls are not parallel, again due to movable baffles, and they are covered with a custom material. The ceiling is parallel to the floor but the ceiling has some treatment. Regardless, I do want some room sound (the wooden floors). Some home studios go overboard with treatment which is not only unnecessary, but usually kills all room sound when tracking which to my ears sounds dead and boring. Also, this is my “home” studio. I go to one of the best local pro studios when I need a great mix room. This room is great for tracking though, and good for mixing. Not going to help what? That’s just where I sometimes leave them when I’m not at my desk. Btw, I mix with my headphones 80% of the time (see next comment). They’re not too low. My seat is low for my piano and the monitors are arranged perfectly. Listen to my album on iTunes and tell me that’s not a pro mix. I tracked it in this room (except for the drums), and it was mixed here and at another studio. Not all studios are built for the same purpose. I write and track band music, and compose and mix orchestral music. The environment is fine. Bizamm!! Take some of that! Nice setup! One question: Which version of osx are you running? I’m wondering because I run a 2009 mac, but still run 10.6 (snow leopard). I would recommend staying on Snow Leopard. On any Mac released before 2013, they should not run beyond OS X 10.9 Mavericks for optimal performance. OS X Yosemite is the worst performer of all time, competing with OS X 10.0 (basically the first public beta) in it’s instability and horrible performance. You can brick a 2012 Retina iMac with Yosemite, that’s how bad it is, a $3000 computer will run worse than a 386 with Windows 95, not an exaggeration. For newer Macs, 2012 and above, with 16GB of RAM and an SSD, OS X 10.11 El Capitan is good. But really for anything older than before, stay with OS X Mavericks or Snow Leopard, the performance is superior. I have seen many users regret upgrading to Yosemite and El Capitan, and it’s very hard to revert back without erasing everything. J – I’m currently using Mavericks 10.9.5. However, with a MacPro (even a 4,1 or 5,1), what OS I’d run really depends on which CPUs I had, how much RAM I had, what my storage was like, what apps in particular I was using and if I needed access to certain iOS and iCloud services on that computer. So, from that perspective I don’t agree 100 percent with Girl’s comments but they’re not far off the mark. My host MacPro is a 12-core @ 3.46GHz, with 96GBs of RAM, an Amfeltec PCIe card that hosts four M.2 SSDs (I get 6000MB/s reads from my sample drive). So, the extra features that were added along the way from Snow Leopard to Yosemite don’t cause me a problem, at all. My opinion is this. It’s between 10.6, 10.9.5 or 10.10.4. I’d skip Lion and Mountain Lion altogether. If you’re just running a DAW, or a you use that Mac for a single app, and you do all your iCloud, iOS, email and other stuff on another Mac or iOS device, sure, stay with Snow Leopard if your main apps on that Mac are from that same time, or still run fine with 10.6. Otherwise, if you have Xeons and enough RAM and maybe an SSD and you want to run a more current version of OS X I suggest either Mavericks 10.9.5 or Yosemite 10.10.4. 10.9.5 with the current Security Updates runs stellar on my MPs. In 10.10.4 Apple natively included support for 3rd party SSDs in the form of the Terminal’s trimforce command. That was a big deal for me as I didn’t want to rely on Trim Enabler forever. It’s also a stable OS. I spent several weeks comparing the stability and speed of 10.9.5 to 10.10.4 on one MP, with the same exact install of apps and found 10.10.4 to be a bit more stable and faster than 10.9.5. I also like a lot of the new features in Yosemite’s Finder and Safari compared to Mavericks (although I think Yosemite is a huge step back in the GUI department). Great setup! Very informative to see. I am wondering if I can use my old MBP (2011, 17″, i7, 2,3) to be a slave with my new MBP as I do all my work on a laptop and I don´t think I´ll be getting a lot for the older machine. I am though, total new to this master-slave setups so I would appreciate good advices or links to read about it. I work mainly in Logic Pro X with different libraries on external hard disks. Gisli – I’m sorry I’m just now seeing your post. Do you still have questions? If so, please ask again and I promise to check back in a few says and answer. To answer this question, the master/slave setup is no big hassle to setup and work with. It’s just two or more computers spreading the workload. Two MBP’s could be connected with an ethernet cable which the audio travels over and then back through the host MBP to your one interface. The ways for doing this are VSL’s awesome Vienna Ensemble Pro 5 (and you can use a demo from VSL for 30 days, although you’ll need a Steinberg Key, but it’s in a league of it’s own). Logic has Apple’s Distributed Computing built in but not as many people use that feature as FCPX users do, but if you’re just wanting more CPU power for audio processing it might work for you. Bidule is an older app that was quite popular. VEP is king now though. Whether or not you really need a slave depends on how many resources you’re using up on your main MBP. the idea of a slave is to keep your host snappy by not filling up the RAM or maxing the CPU, that way your DAW has plenty of headroom toward in. Your MBPs will sound fine but you must max out the RAM. Basically the whole point in having a multi-computer setup is to have a mini supercomputer in your home able to spread out resource heavy music software amount them. you might get a clearer picture of how this all works. 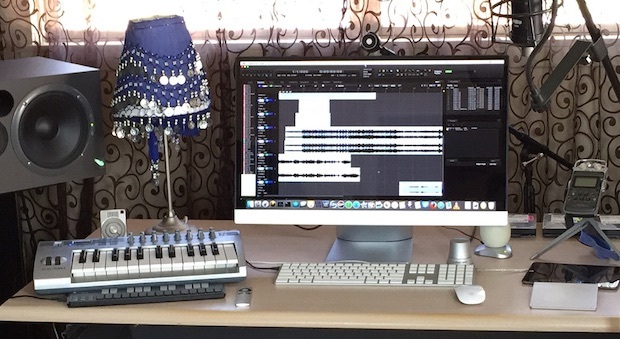 I’ve since upgraded my studio to include an iPad Pro (which integrates great in my rig), another 12-core MacPro and much more software. So despite some the headaches of running a host/slave environment, basically there are no limitations. Huge orchestras with synths and bands all playing at the same time with reverbs and many other effects in real time are no longer a problem for my rig. And DP with VEP is as solid as a rock. Hope that made up for lost time! I’m very much heavily into sampling, drums, strings, etc and live recording. But it should be something professional for a rapper/musician. Sam – I assist pros, students and home studio owners with software and hardware purchasing, set ups and training. I’d be glad to help you. The above article is about my studio (as it was two years ago). Go to my website and contact me via the contact page. You can also check out my YouTube channel which has DAW and software tutorials for film composers, but covers some general stuff as well. There’s a link to it on my website. Setting up a rap recording and production studio is a fairly straight forward process. I do more than film scoring at my studio. 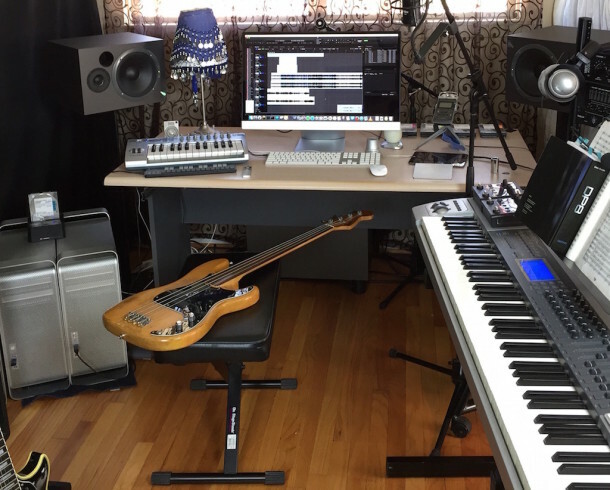 My studio is a hybrid film scoring/music production studio.